As the National Institute of Diabetes and Digestive and Kidney Diseases (NIDDK) describes it, vascular access is so important to a hemodialysis patient that it can be considered a ‘lifeline.’ However, this vital access site is prone to stenosis, thrombosis, and costly re-interventions. Laminate Medical Technologies hopes to support this critical lifeline with a first-of-its-kind external support device for AV fistulas that alleviates wall tension and regulates an undesired narrowing of the vein and/or frequent blockages of the blood vessels. As we discussed in Part 1 of this post, end-stage renal disease (ESRD) is a costly and growing global health problem. It impacts about two million people worldwide, and the number of patients diagnosed and those receiving regular, lifelong hemodialysis to filter wastes from their blood is rising at a rate of 5-7% per year. Vascular access complications such as early failure, thrombosis, and infections account for nearly 30% of hospital admissions in hemodialysis patients, and consume a significant proportion of outpatient resources, including vascular access monitoring and diagnostic imaging. 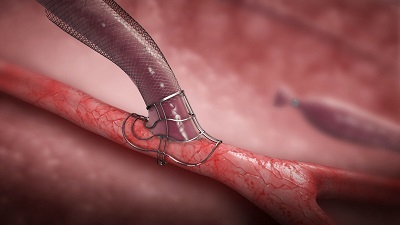 Tel Aviv, Israel-based Laminate Medical Technologies, founded in 2012, hopes that its novel external Nitinol mesh support device, VasQ, will drive a change in the hemodialysis vascular access treatment paradigm. The CE-marked device, shown below, is designed to help optimize peri-anastomotic vascular flow and directly address the biomechanical causes for the high and costly re-intervention rates in hemodialysis patients undergoing arteriovenous fistula (AVF) surgery. The crush- and kink-resistant VasQ device is placed over the fistula during a standard AVF surgery. It serves to create an optimal geometrical configuration between the vein and the artery, reducing problem-causing tension in the vein and speeding maturation of the fistula. It regulates blood flow by constraining and shaping the fistula, reinforcing and shielding the perianastomotic vein against high pressure, wall tension and flow levels, says co-founder and CEO Tammy Gilon, in an interview with the Community Blog. “There is no other device addressing the two root causes of fistula failure, which are turbulent hemodynamics at the junction area between the vein and the artery … and narrowing in the vein caused by neointimal hyperplasia that leads to stenosis,” Gilon says. Randomized controlled trials in Europe, as well as feedback from the company’s first patients who are more than four years out from implantation, have shown that the implant significantly improves patient outcomes versus standard AVF surgery, with rapid fistula maturation, good vessel flow and diameter, and no adverse events. The VasQ device is commercially available and routinely used across more than 25 hospitals in Germany, Gilon says. “It is very rewarding that patients are seeing the benefits of our device,” she continues. Late last year, Laminate Medical began a pivotal, FDA IDE-cleared trial of its VasQ device, following FDA investigational device exemption approval in August. More than half of the study’s planned 129 patients have been enrolled to date at leading academic centers across the US. The company is also conducting an 80-patient, multicenter post-market study in Germany, the United Kingdom and Spain, which will study both forearm and upper arm fistulas employing the VasQ device, with one-year follow up. Laminate Medical also plans a multicenter trial to begin in China in the second half of 2019, in support of CFDA approval projected in 2020. Gilon, with a background in mechanical engineering, has always had a passion for emerging technologies that can impact patients’ lives. Prior to meeting co-founder Dr. Eyal Orion in 2011 and working with him to co-develop Laminate’s external support device, she was an engineer at transcatheter valve repair company Valtech Cardio Ltd. (acquired by Edwards Lifesciences Corp. in 2016). She envisions a future in which ESRD patients can be treated more effectively via dialysis or alternative treatments in the home, and thus lead as close to normal lives as possible. Laminate Medical, a presenter at MedTech Strategist’s Innovation Summit San Francisco 2018 conference this past November, raised $12 million in a Series C financing round at the end of 2018. In the upcoming Part 3 of this post, we take a look at the Kidney Innovation Accelerator (KidneyX), a public-private partnership between the US Department of Health and Human Services and the American Society of Nephrology in which they have committed $2.6 million in prize money for an ongoing nationwide competition to accelerate innovation in the treatment of kidney disease.